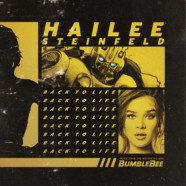 Today, Academy Award®-nominated actress and multiplatinum recording artist HAILEE STEINFELD releases “Back To Life,” from the upcoming motion picture Bumblebee. Get it HERE via Republic Records. “Back To Life” features prominently in Paramount Pictures’s upcoming Transformers spin-off, Bumblebee, in which STEINFELD stars alongside John Cena. The soundtrack will be available in stores and at all DSPs when the film opens in theaters nationwide December 21. STEINFELD will perform “Back To Life” for the first time live at the MTV EMAs on Sunday November 4. Additionally, she takes the stage as the host of the awards show and will be up for “Best Pop Artist.” Just last year, she took home “Best Push Artist.” The EMAs airs live globally from Bilbao Exhibition Centre, Spain at 9pm CET. STEINFELD remains an undeniable presence throughout music, film, and pop culture at large. Her influence will only grow in 2019 with more music and surprises in the new year!